It likely would not have taken a rock star, legendary songwriter or even run-of-the-mill guitar enthusiast to notice the flaw, so it’s encouraging that it was dealt with quickly before Thursday’s much-anticipated grand opening. However, another more intriguing and perhaps more dire issue that should hopefully soon be resolved is the casino’s ability, or lack thereof, to offer sports betting. Hard Rock will offer an extensive lineup of show-stopping acts in two completely refurbished venues, bringing plenty of excitement all their own to the Boardwalk. From rock and roll artists like The Cult, Counting Crows, Live and Steely Dan to comedy stars Jon Lovitz and Howie Mandel the schedule is impressive. While the fledgling casino has expressed interest in committing fully to entertainment first and worrying about other matters second, it feels as though it’d be missing out on the biggest ticket in town (literally) by not immediately offering sports betting. Ever since mid-May, sports betting has been legal at the federal level in the United States after the Supreme Court voted to repeal PASPA, the 1992 federal ban on sports betting. Since then a variety of racetracks and other gambling properties have leapt at the chance to secure appropriate sports betting licenses. According to Michael Pollock, managing director of Spectrum Gaming Group consulting firm, the choice to open for business without sports betting will be a benefit to other Atlantic City operators. Perhaps the most prominent of those operators is the brand new Ocean Resort Casino hotel which is also slated to open Thursday. Along with its own lineup of festivities to mark the occasion, the casino will offer sports betting at a temporary sportsbook while the planned 7,500-foot William Hill-operated sportsbook is under construction. The deal between William Hill and Ocean Resort was announced back on May 29 much to the excitement of chairman and owner Bruce Deifik who secured the property's sports betting and casino license just last week. A slightly conflicting New York Times piece by Patrick McGeehan told a different story Monday, however, as it stated Hard Rock is actually close to signing with a provider of sportsbook services and a well-known one at that. 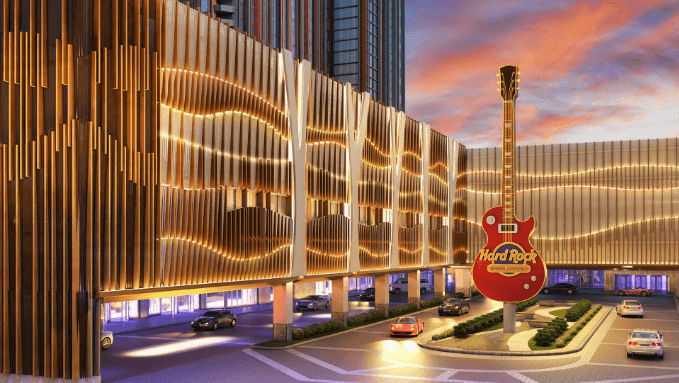 Hard Rock International CEO Jim Allen apparently informed the Times of the company’s intent to begin accepting bets soon, citing the importance of the brand’s success not just for its own well-being but the city’s. “If a brand like Hard Rock fails in Atlantic City, the interest in investing capital in that town is going to diminish significantly,” Mr. Allen said. “However, if we are successful, then I think the future is very bright in Atlantic City.” Mr. Allen said the Hard Rock was preparing to announce a partnership with a company that would run a sports book in the new casino. He said he expected sports bets to provide a modest boost to the casinos’ profits and to draw people in during big events like the Super Bowl. The only current certainty is that nothing appears to be certain regarding sports betting at the fully refurbished property. There are still concerns by some over the role Hard Rock’s stadium naming rights agreement with the NFL’s Miami Dolphins could be playing in the delay. All that being said, it appears that while the property definitely will not be accepting sports wagers on day one, the future beyond it is completely unknown and could soon be revealed.